If you’re looking for anything but ordinary, then the A3 is exactly what you’re searching for. It’s not typical, it’s out of the box, confident and on trend. 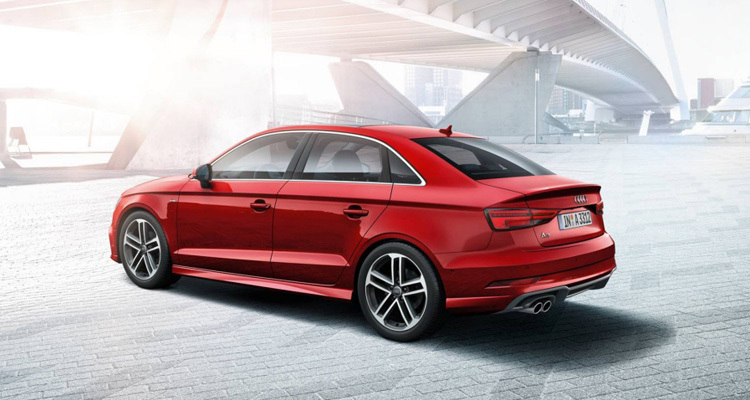 The A3 is prepared to take on the world, are you ready to go with it? Everyone knows how important first impressions are. You want to stand out and be seen. The Audi A3 is low, wide and astonishingly compact. Sleek lines and a sporty exterior combine with the single-frame radiator grille and create a powerful look. Come test the 2018 Audi A3 out for yourself in Edmonton, AB here at Southgate Audi. With a top speed of 209 km/hr the 2018 Audi A3’s engine is made for performance and power. With five variations on the 2.0-liter TFSI four-cylinder engine including quattro versions for the all wheel drive models, the direct-injection engine yields capability no matter which trim you choose. Available with up to 220-horsepower and 258 lb-ft torque, you’ll feel adrenaline in every turn. In the Technik trim level you can go from 0-100km/hr in 6.2 seconds. The max fuel efficiency is a combined 8.0L/100km on the Progressiv and Komfort engines. No matter which engine you choose you’ll have a great time going to your destination. The 2018 Audi A3 was awarded a Top Safety Pick+ award by IIHS. With the standard Audi Pre Sense Front technology, the Audi A3 is rated to have superior front crash prevention getting the full 6 points from IIHS. This technology is engineered for safety. When the systems detects the high probability of an emergency, the vehicle will apply brakes, close windows and may even tension front seat belts. Pre Sense Front is there to help mitigate the effects of a collision. With the available LED headlights your visibility increases even more, illuminating the dark roads around you for optimal visibility. 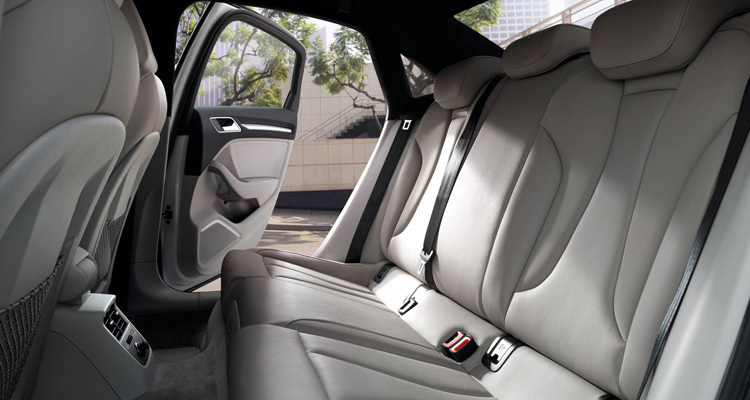 The interior of the A3 is spacious and well appointed, with soft surfaces and standard leather seating. The interior feels bigger than it is due to the breezy design and long wheelbase. Even though this is a small car, it feels accommodating inside. Standard interior features include front heated seats and Bluetooth connectivity. The MMI radio with a 7-inch colour display comes standard on the Audi A3, so you can feel connected and enjoy your music wherever the road takes you. The available MMI Navigation gives you the ability to input destinations and get where you are going with just the swipe of your finger across the track pad. Audi Virtual Cockpit is also available on the A3, which is a driver focused 12.3-inch display directly in front of the driver that gives information about the road and vehicle in brilliant high definition. There are three trim levels available on the 2018 Audi A3: Komfort, Progressiv and Technik. Each amazingly functional in their own right, you’ll be able to find the trim level that suits your lifestyle. The Komfort trim level comes standard with the luxury features you’d expect from Audi including a panoramic glass roof, Xenon plus headlights, SiriusXM satellite radio and dual-zone climate control. Intermediately, the Progressiv trim level gives a nice segway between the Komfort and Technik trim levels. The addition of the Audi music interface and a rearview camera add nice additions for those searching for increased features. Finally, the Technik trim level takes things up a notch and adds a wide range of technology features so you have every technology at your fingertips. From the Bang & Olufsen sound system, to the advanced parking system with front and rear sensors, to the MMI navigation, you can do it all from the driver’s seat. Plus you have Audi virtual cockpit! There are also a variety of additional packages available such as the premium package that adds Audi advanced key, rear and front parking sensors and power lumbar on the front seats.